Our reporting options include a range of standard reports providing instant access to the most commonly requested scheduling data. Ranging from coverage and vacation planning reports, to payroll and time-sheet approval reports and including all of the day to day location scheduling reports, our standard reports cover every aspect of your workforce scheduling. Our standard scheduling reports are grouped into four categories: Planning, Control System Compliance and Data Information. Our reporting options include a range of standard reports providing instant access to the most commonly requested scheduling data. Ranging from coverage and vacation planning reports, to payroll and time-sheet approval reports and including all of the day to day location scheduling reports, our standard reports cover every aspect of your store scheduling. Our standard reports are grouped into four categories: Planning, Control System Compliance and Data Information. In the unlikely event that you have a reporting requirement not covered by our standard reports, we can prepare and deliver custom reports. All reports can be accessed from within the product, can be tailored for specific roles and can be easily exported. For those organizations who already have a third party BI tool or data warehouse system in operation, we provide a range of data extracts or replicated database environments. 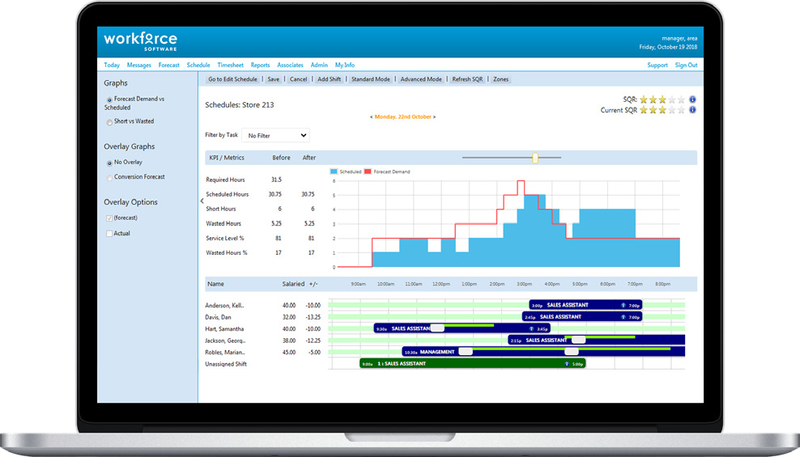 This enables you to easily combine scheduling data with other business system data, using your existing business intelligence tools to generate the management and operational reports your organization needs.